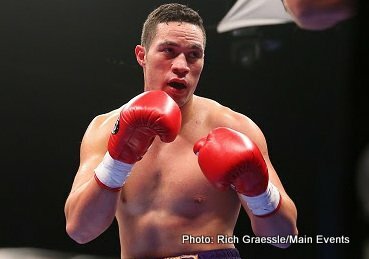 Palmerston North, New Zealand, Saturday 13th of June rising heavyweight Joseph Parker 13 -0-0, 11 KOs) takes on German based Turk Yakup Saglam (34-3-0, 31 KOs). Saglam on his first visit to New Zealand has passed off some lofty proclamations, first been that he gave Wladimir Klitschko so much so heat in sparring sessions the champ couldn’t handle it. Going as far as to say he had the champ ‘scared’ and after only two days of what was meant to be a two week sparring assignment his services were dispensed with. Through a German translator he also had this to say ‘Nobody wants to fight me…. I am too strong and too much of a champion over there (Germany)’. Saglam on the face value sports a very good record, having only lost three of his thirty eight fights. However under closer scrutiny Saglam’s record only contains two notable names, retiring after the second round against Manuel Charr, and stopped in the seventh by Olandier Solis. His third loss came against undefeated but relatively unknown German heavy Michael Wallisch. As a fighter Saglam doesn’t do anything outstandingly well, his base skills are uncouth, and sometimes questionable in having a penchant to hit behind the head. And what he does do well comes down more to temperament as opposed his boxing skills, Saglam is willing, likes to mix it up, likes to fight off the front foot in swarming his opponents, and that makes him really interesting to watch. Against Parker that won’t work, under the tutelage of his trainer Kevin Barry, Barry has taken Parker’s raw athleticism and worked on improving his base skills. In every fight under Barry’s guidance we have seen incremental improvement in Parker as a boxer. Parker’s punch selection is developing, his jab is world class, his speed as quick as any heavy in the world, and in speed there is power. That said these things are still very much a work in progress in binding all the components of project Parker as a boxer together. Parker’s team know this fight in another step in that evolution. Even in the formative stages of his career Parker will simply have too much firepower for Saglam, and Saglam’s willingness to fight of the front foot will be his undoing. Parker is more durable, bigger, stronger and quicker, and with Saglam walking on to the repertoire Parker has at his disposal this fight will end in a Parker KO…perhaps an early one, and with the added incentive of Parker dedicating this fight to All Black rugby player Jerry Collins who recently passed there will be even more impetus for him to win big. My pick – Parker inside 3.